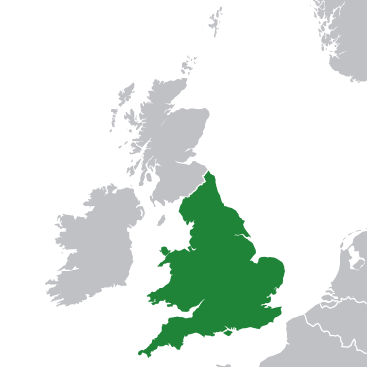 The Kingdom of England was a sovereign state on the island of Great Britain from the 10th century, when it emerged from various Anglo-Saxon kingdoms, until 1707, when it united with Scotland to form the Kingdom of Great Britain. In the early 10th century the Anglo-Saxon kingdoms were united by Æthelstan (r. 927–939). In 1016 the kingdom became part of the North Sea Empire of Knut the Great, a personal union between England, Denmark and Norway. The Norman conquest of England in 1066 led to the transfer of the English capital city and chief royal residence from the Anglo-Saxon one at Winchester to Westminster, and the City of London quickly established itself as England's largest and principal commercial centre. Histories of the kingdom of England from the Norman conquest of 1066 conventionally distinguish periods named after successive ruling dynasties: Norman 1066–1154, Plantagenet 1154–1485, Tudor 1485–1603 and Stuart 1603–1714 (interrupted by the Interregnum (England) of 1649–1660). Dynastically, all English monarchs after 1066 ultimately claim descent from the Normans; the distinction of the Plantagenets is merely conventional.